Will higher development costs affect GTA high-density land prices? Brivia Group Inc. has purchased a prime downtown Montreal development site which could offer nearly a million square feet of buildable area. 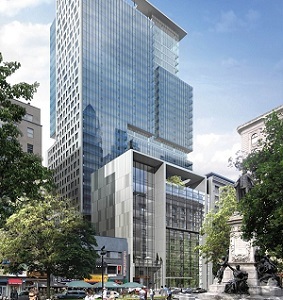 Brivia paid $45 million for the 79,864-square-foot property, located at 1201-1215 Phillips Square, according to JLL Montreal’s Capital Markets Group, which executed the sale. The vendor is Canderel Group of Companies. The Phillips Square site is just off of the city’s primary commercial artery, Sainte-Catherine Street. It represents an “exceptional development opportunity” of 925,000 square feet or more, JLL says in a release announcing the sale. On its website, Canderel calls it “one of the last prominent downtown locations in Montreal for the construction of a new office tower.” Canderel also lauds the easy access to the Montreal Metro system and major highways such as the Bonaventure and the 720 (Ville Marie Expressway). When Canderel purchased the site, used as a parking lot, in 2015 it was planning a LEED-certified office tower with up to 140,000 square feet of retail space at the base. Canderel is a Montreal-based company offering property acquisition, development and management, construction, leasing, marketing, and asset management services. Canderel develops top-tier commercial, retail, industrial and high-tech spaces nationwide, which serve a wide array of businesses. Through a Canada-wide network of brokers, Canderel has leased thousands of offices in properties it owns, manages and represents, and has also marketed and sold over 7,500 condominiums. It also has offices in Toronto, Edmonton, Calgary and Vancouver. Brivia is also Montreal-based and owns a portfolio of a half-dozen apartment and condominium properties in the Greater Montreal Area. It’s also developing the Nest Condominiums at Crescent Street and Rene-Levesque Boulevard. The Real Estate News Exchange (RENX) is an online service that provides news, information and commentary about the Canadian built environment. 2018 Real Estate News Exchange (RENX).